Once your time with your storage unit has come to an end, the next step is to unclutter your items from the unit. In some cases, items have been piled up in the unit for so long it’s difficult to figure out the right way to start getting them out. It can be a daunting task, but luckily, there is a way to have everything cleaned up without stressing you out. Check out our tips below to ensure your time spent cleaning is worthwhile as well as simple. The most important thing you can do for yourself when de-cluttering is giving you plenty of time to do so. As stated above, some items have been piling up in storage for years. Having it cleaned out completely isn’t something that can be done in a few minutes or even hours. Instead, it is recommended that you be sure to set aside a few days in order to get everything completely straightened out. Tackling the clutter by yourself can be done, but not nearly as effective as with others. Consider calling your friends or family to assist you so the job can be performed faster. If that still doesn’t help and you are on a time crunch, there are professional services available that can actually clean out your storage unit for you if you so choose. Before you really get started, make sure you know what it is that you are taking out. With your pen and paper, or even your phone, write down all the boxes you have in your unit and be sure to count them as well. This way you can have an idea of where they will go once everything is pulled out. Once you start working, you might find that you have more on your hands than you originally thought. Thankfully, there is an easy method that can help you with this called the four-box method. It’s a simple trick that breaks down your items into four categories: keep, toss, store, and sell/donate. This way of organizing can help speed up the process exponentially. Although you may be tempted to jump into cleaning all at once, try to refrain from doing so. Instead, start with one room or area at a time. This works well when paired with the four-box method and can get things moving even quicker. With your items being moved to new locations, it’s a good idea to take time to figure out where they will be going to. If you decide you are storing items at your home, just not as many as you originally had, make sure there is enough space for them. With that being said, don’t store too many items in your home or else you could find yourself in need of a storage unit again. On the other hand, if you are donating your items, be sure to contact your local shelter to let them know, especially if you have a lot of items or large items. Oftentimes after your items have been officially decluttered there can be bits of residue left behind. 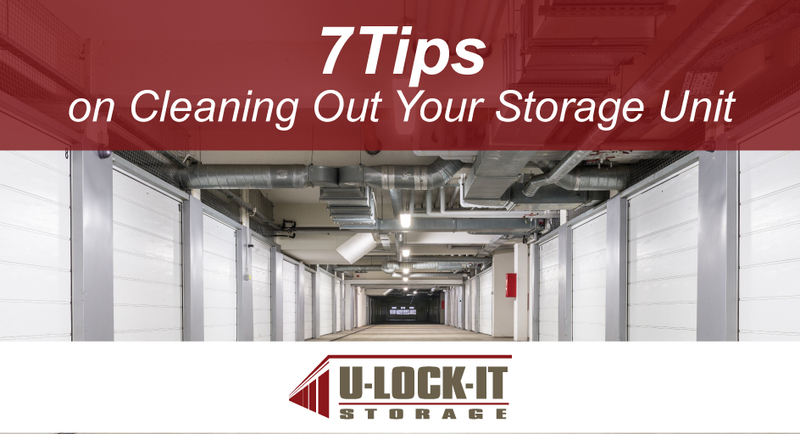 Take the extra time to give back to your storage unit facility by sweeping out what was left behind. This way the unit can be prepped and ready for the next owners. At U-Lock-It, we know exactly how to make the most of your storage unit. For more tips and tricks, be sure to contact us at (256) 373-5495. We are happy to help you in any way!